It’s a tough gig being a character on the hit HBO television series Game Of Thrones. No matter how popular you are or how prominent your character is, you’re just as likely to die as the next foot-soldier or white-walker. You could be one of the main characters- Ned Stark would know about this- and then before you know it, your head is rolling from your shoulders in a morbid display that only series creator George R. R. Martin could have determined. This little gift book is the perfect commemoration to all those who have fallen in their roles during series one to four of the television series. As is usually the case, it is best to have seen all episodes of the shows before perusing a book like this, lest you find yourself with an uninvited or unwanted spoiler alert for your television viewing. If you are a fan of the show, you will likely remember most of the characters, both major and minor who feature in this book. 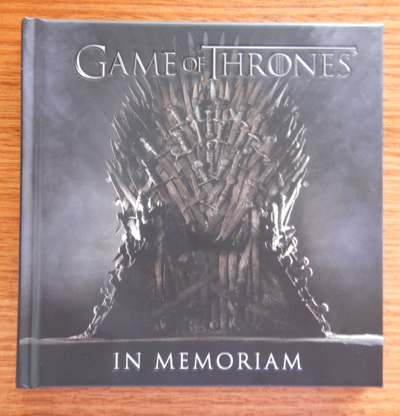 Each page features a photography still from the show, and further information including quotes, character profiles and house information (if the deceased came from a specific family). For those who are interested, it appears that the deaths are laid out in chronological order (of the episodes) with one particular character appearing no less than six times throughout the book (having been brought back to life numerous times). The world of Game Of Thrones is a dangerous place, as any fan could tell you. If you need any proof at all as to the mortality rate of the characters (approximately 14 deaths on average for every episode), then the thickness of this little gift book (which only really features memorable characters!) is sure to prove it.